My review of the afternoon tea at The Pierre hotel in New York. I rate the service, the tea, and the food from tea sandwiches to sweets. 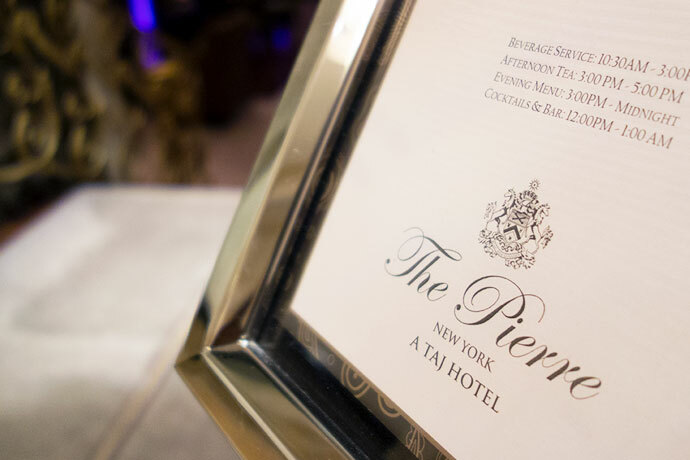 The Pierre is a luxury hotel on the Upper East Side on Fifth Avenue, facing Central Park. Years ago, The Pierre served afternoon tea in The Rotunda, a grand dining room covered in garden-motif murals. Afternoon tea at The Pierre at that time was my absolute favorite. It was a fancy affair with literal white glove service. The servers had our teapots at a nearby table and would come by to top off our teacups. I was astounded by the service — they knew exactly when I needed more tea. The Rotunda was the perfect setting for afternoon tea — it was right out of the movie Marie Antoinette. Colorful, posh, perfect. I don’t think any afternoon tea spot can replace the special place I have in my heart for The Pierre. Alas, *wrist on forehead* The Pierre no longer serves afternoon tea at The Rotunda. BOO! Instead, tea is now served in the Two E Bar & Lounge. The Pierre does a consistent afternoon tea and each time I’ve gone, it’s been very good. Afternoon tea is a set menu, which means that when you order one of their afternoon teas, you don’t get to pick each food item. Instead, you get all the food listed for that afternoon tea. Don’t worry, everything is bite-sized and perfectly mini so you won’t be completely stuffed by the end. Afternoon tea is priced per person and everyone at the table orders their own. 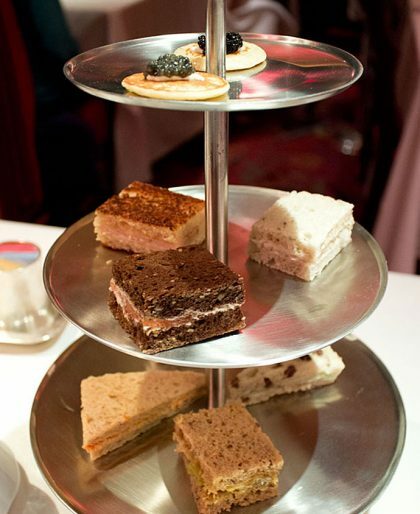 An order of afternoon tea comes with a pot of tea and three-tiers of food. You don’t get to pick the food but you do get to make your own tea selection. 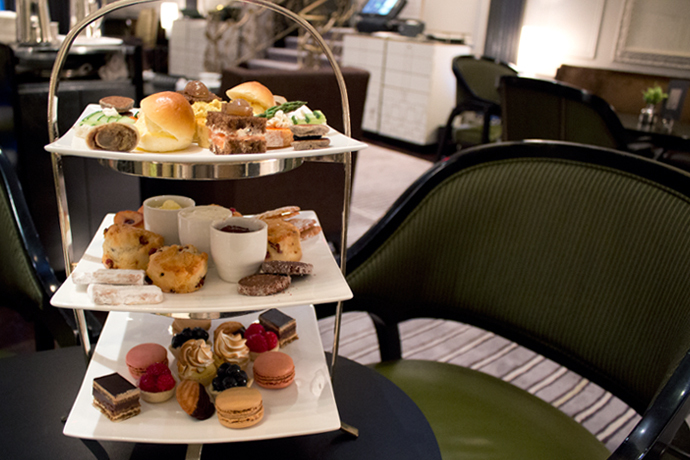 Does The Pierre Have More Than One Kind of Afternoon Tea on the Menu? 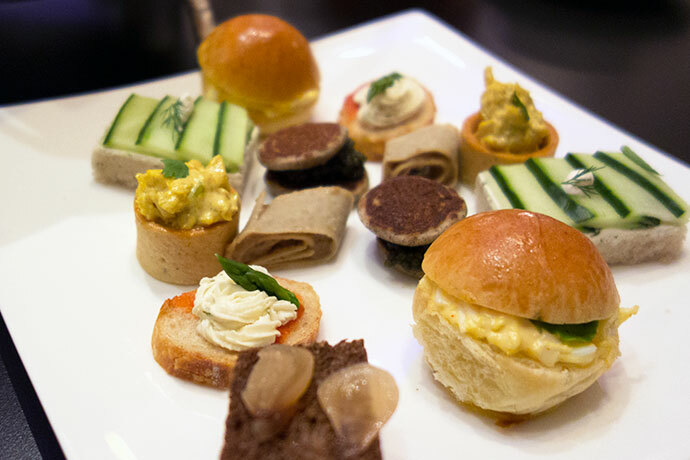 Yes, there are 4 kinds of afternoon tea options on the menu at The Pierre. There’s the Traditional Tea Service (the classic and the one I usually get), the Royal Tea Service (the Traditional plus Champagne), the Unlimited Royal Tea Service (eat everything you can in 1.5 hours! ), and the Tiffin & Tea (afternoon tea with an Indian twist). How Much is Afternoon Tea at The Pierre? The Traditional Tea Service is $69 per person. You get a pot of tea and the classic three-tiered tray filled with savories, scones, and pastries. The Royal Tea Service is $89 per person and it’s the same food as above but you can choose one of two Champagnes. The Unlimited Royal Tea Service is $120 per person and you get unlimited food and drink for 1.5 hours. I personally don’t love this idea since afternoon tea isn’t about filling your stomach up for the winter. This goes against the very idea of afternoon tea which is a light meal between lunch and dinner. The Tiffin & Tea is unique to The Pierre and it’s $65 per person. 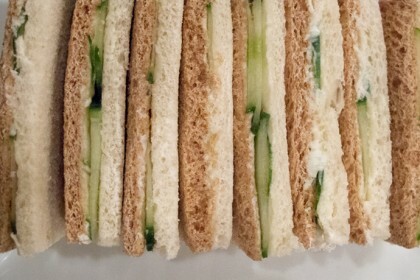 The small bites include Cucumber & Mint Chutney Sandwich, Spiced Chicken Samosas and Mango Lassi Creme Brulée. I’ve had it and I really like it. Try the Tiffin Tea for an exotic twist to afternoon tea — the savories are fantastic! Do I Need to Make a Reservation for Afternoon Tea at The Pierre? Reservations are strongly recommended so yes, please make one at least 24 hours in advance. If you have any food allergies or special requests, let them know. What Do I Wear for Tea at The Pierre? The Pierre doesn’t specify a dress code so I would go with smart casual — look put together and dress neatly. If you want to go in jeans, so with a dark wash and no rips. I would avoid wearing sneakers. How Long is Afternoon Tea at The Pierre? Afternoon tea typically lasts about two hours. Don’t rush and enjoy this little moment of luxury. What Time is Afternoon Tea at The Pierre? 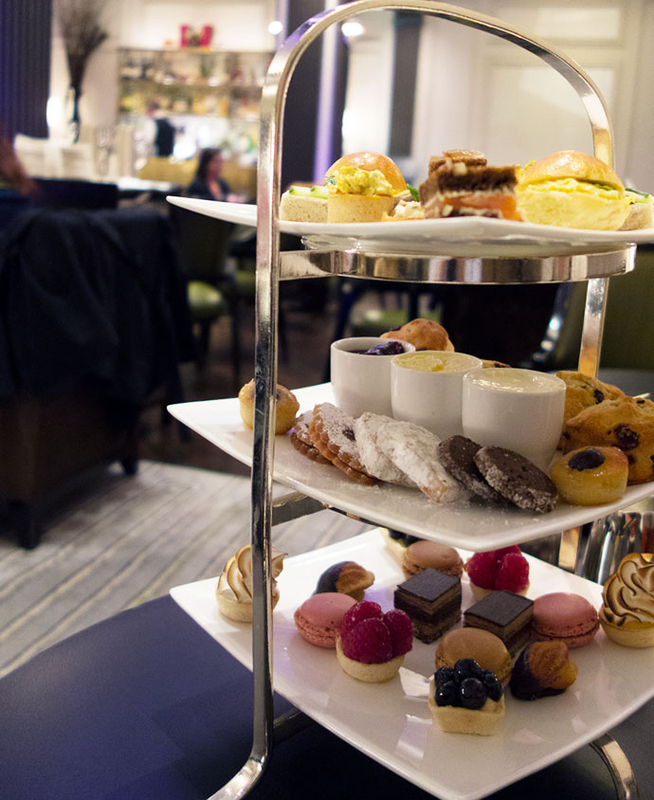 Afternoon tea is served daily at The Pierre in the Two E Bar & Lounge from 2PM – 6PM. How Does Afternoon Tea at The Pierre Work? 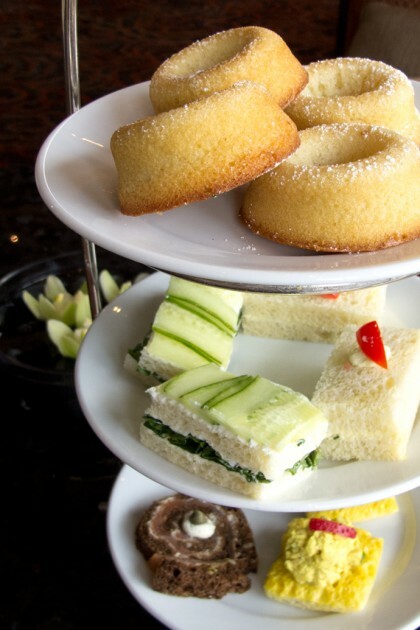 First, decide on which of the four afternoon teas you want to order. 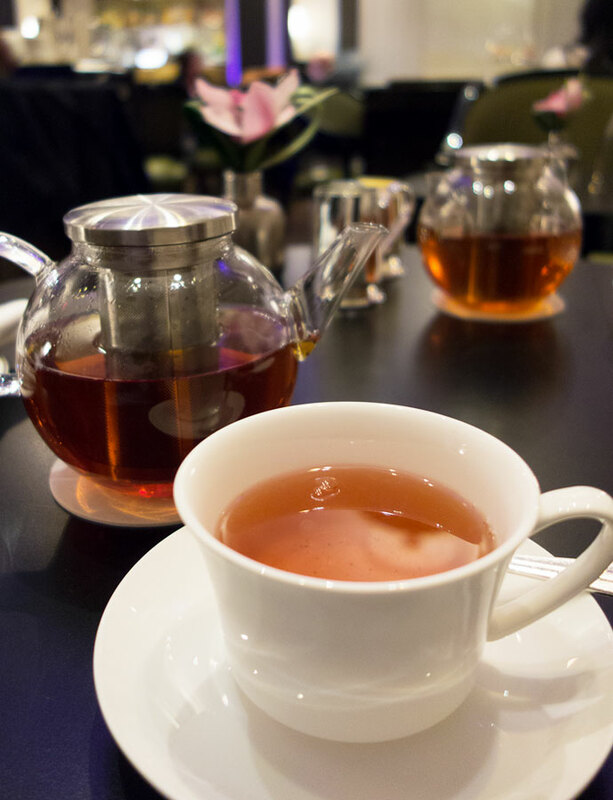 The Pierre offers four afternoon teas: Traditional Tea Service, Royal Tea Service, Unlimited Royal Tea Service, and their Tiffin Tea. 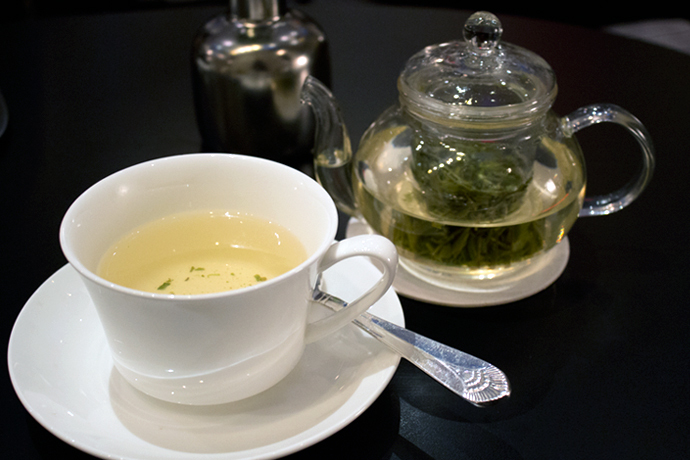 Once you’ve figured which afternoon tea, pick a tea from their list of teas. Black tea is the most popular tea to get with afternoon tea. If you’re not sure which one to get, go with the Pierre Blend, a blend of teas custom made for the hotel. After the order is placed, the tea will be served first, followed by the food. Needless to say, I was upset that afternoon tea moved from The Rotunda to The Two E Bar & Lounge, which is a space not exclusive to afternoon tea. The Two E Bar & Lounge is a casual hotel lounge where you can get everything from cocktails and small bites to afternoon tea. It has a grand, old hotel feel, although it’s a little dark due to the lack of natural light. Great service every time. They’re great about making sure your teapot has enough hot water and they’re very good about refilling it. The tea is from Palais des Thés, the same French tea company that The Plaza uses. The tea selection is very heavy on the black tea blends and has three green teas and three herbals to round out the tea menu. A three-tiered tray arrived with the exact same savories, scones and sweets served as the year before, which I had loved. All miniatures, and all very good. There’s a nice variety of mini savories and each person gets six. The middle tray holds 2 scones per person and it comes with lemon curd, clotted cream, and jam. Scones were flavorful, fresh and were a good size — not too big. A nice selection of sweets, which I regretfully couldn’t finish since I was too full! The portion sizes on the sweets were perfect — you can eat them in two-bites. The marshmallow meringue was especially good. Oh, and the tarts were also a highlight. They were fresh and delicious. The Art Deco lounge is a bit cold, impersonal, and a little too masculine for my liking, but if you can overlook the ambiance, the afternoon tea is solid. 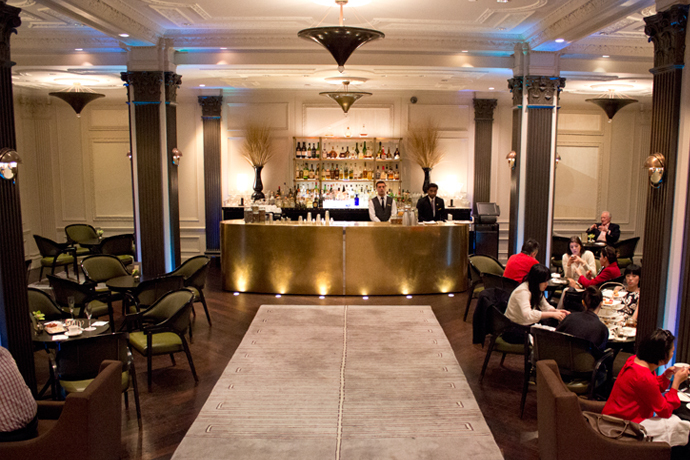 In 2013, afternoon tea at The Pierre was $55 and the Two E Bar & Lounge looked pretty much the same as it does now. Tea was served in personal glass teapots. The three-tiered tray has been looking pretty consistent. Love how everything is all mini and perfectly portioned. I have never been there. Thank you for this review..Looks lovely. Hi Winnie, next time you're looking for a place for afternoon tea in NYC, give it a try! 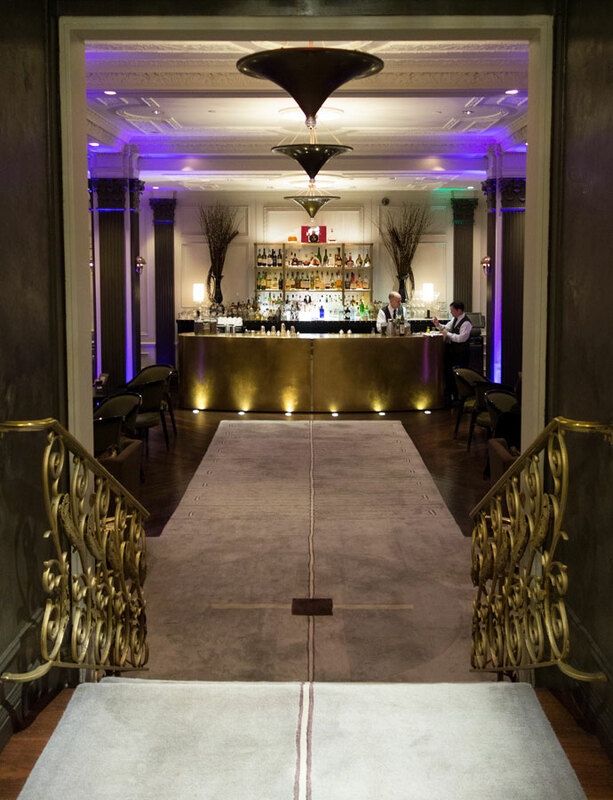 I do meet my friends or my husband here from time to time.I like the space due to the darker, more intimate ambiance. One does not overhear the conversations at the neighboring table. I don’t need to worry about my wrinkle or a light make-up. It is conveniently dark. Service is always reliable, professional. Hi Pia, very true, the lighting, the spacing of the tables, and service makes The Pierre’s Two E Lounge a great tea spot.